Ernest Blumenschein was born on May 26, 1874 in Pittsburgh, Pennsylvania. When four years later his mother died, his father accepted a position as director of the Dayton Philharmonic in Ohio, where Blumenschein grew up. When he finished high school, Blumenschein received a scholarship to study violin at the Cincinnati College of Music. 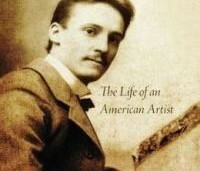 Blumenschein returned to New York in 1896, to work as an illustrator in a studio shared with Bert Phillips. In early 1898, he took an assignment that required him to travel to Arizona and New Mexico. That Spring, he convinced Phillips to join him on a second journey to the American West. Their first stop was Denver, Colorado, where they bought art and camping supplies, a wagon, horses and a revolver. Thus equipped, they set out with the intention of reaching Mexico. In northern New Mexico, the rough road caused a wagon wheel to break. Blumenschein brought the wheel to be repaired in nearby Taos, leaving Phillips alone with the wagon. When Blumenschein returned three days later with the repaired wheel, they continued to Taos, where they sold their horse and equipage, set up a studio and began to paint. Blumenschein stayed in Taos for three months, returning to New York to resume his career as an illustrator of popular magazines and while Phillips remained in Taos. Blumenschein returned twice to Paris to pursue further studies at Académie Julian: once in 1899 and again from 1902 to 1909. During the latter stay, he met and married artist Mary Sheppard Greene.The couple returned to New York in 1909, where they worked as an illustration team. Blumenschein also took a teaching position at his alma mater, the Art Students League of New York. In 1910, Blumenschein was elected into the National Academy of Design as an Associate member, and became a full member in 1927. From 1910, he spent his summers in Taos. In 1915, he became a co-founder of the Taos Society of Artists, together with his friends Bert Phillips, Joseph Henry Sharp, and three other artists. He finally settled permanently in Taos in 1919. From 1920 to 1921 he served as president of the Society. In 1923, he refused to accept the position of secretary of the Society, giving his commitment to an office of The New Mexico Painters, another group he had helped form, as his reason for the refusal. The other members of the Society refused to accept his excuse, and after a heated argument, Blumenschein resigned from the Society. The style of painting of the Taos painters was to decisively influence the perceptions that the wider world came to have of the American Southwest, specifically of the Pueblo and Navajo Indian peoples.